At last we are off to Poland, but to what I cannot say exactly. Unlike prvious trips I really don't have a good grasp on Poland, even though it is the land of some of my forefathers. It's not that I don't like Poland, far from it. But for one reason or another I've been somewhat behind on every project this spring. We've been playing catchup and as a result I never got a lot of time to sit down and learn more about this amazing country. What little I did read was fascinating. I found a very good film called "with Fire and Sword" which was beautiful. It was a little tricky to follow because Poland (like much of the world beck then) had shifting alliances. The Cossacks in particular seem to have a volatile relationship with the Poles. The tour group we are traveling with is being led by some die hard Hussar reenactors out of Chicago. They've come to participate in the 400th anniversary battle of Kluszyn. We already met one of them at the airport. 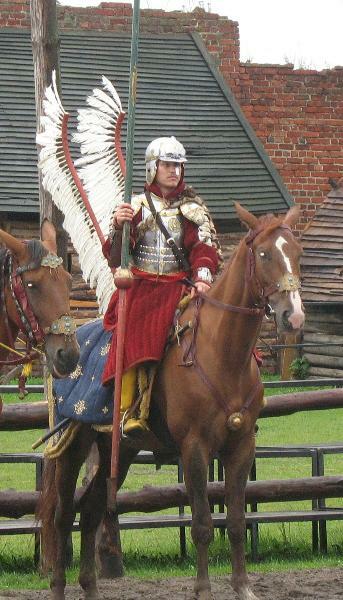 He's traveling with his armor, helm, swords and wings (do a search for winged Hussars, it's impressive). I'm traveling much lighter. A zupan jacket, hat, trews and my pointed boots from Son of Sandlar. Of yeah, and my new haircut. Here are some details of the tour we are taking to Poland.